Honey Cookery by Ruth Mead is a practical source of recipes using the bounty of your hive. Includes both sweet and savoury as well as medicinal, cosmetic and household products. 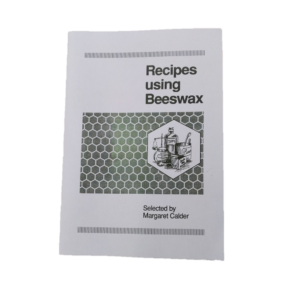 An indispensable source of inspiration for using your excess honey and beeswax. an essential reference for the beekeepers kitchen to ensure the excess honey crop is used to advantage. includes recipes for savoury meat and fish as well as dressings and beverages (including a recipe for mead). sweet recipes that will make your mouth water. These include cakes and fillings, puddings and biscuits as well as fudge and taffy and nougat. a section on medicinal as well as cosmetic and household gives you other practical uses for your hive products. The Honey Cookery Book provides you with traditional recipes that you will enjoy making while knowing you are giving your family the best.